We took a look at Eden Star’s early footage last month and saw an exceptionally promising young game in the making. Equal parts Minecraft, Mirror’s Edge and Half-Life 2, Eden Star offers a vast world to traverse, construct and hunt in. With the pre-alpha welded together, Birmingham based studio Flix are now looking to the public for some funding. To the Kickstarter machine! Eden Star has a wonderfully simple premise: explore the wreckage of planet Pharus 7, discover what happened here, and help terraform the surface. You’ll be provided with an Eden Kit which acts as a micro terraforming factory and base. Once set up, you’ll have to defend it from agressors, whilst also heading out into the world to find new resources and secrets. Resources you find will allow you to construct a fortress around your Eden Kit to ensure maximum protection. The Minecraft-like system works in blocks, but due to its innovative physics system, Eden Star doesnt have any snap-to-grid nonesense. Place those blocks where you want, make the space fort you always dreamed of! And when it’s finised, scale its walls with a beatuifully fluid parkour system. It’s like being an Assassin, but in space. 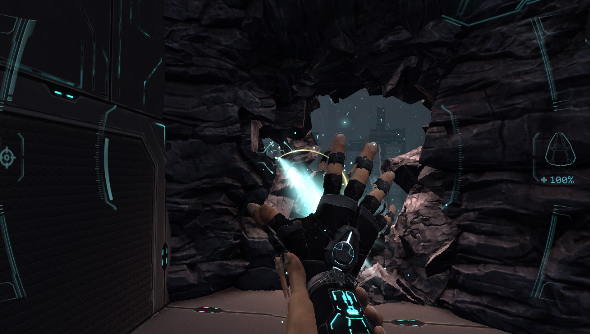 The heavy physics nature of the game also lends to a spectacular-looking combat system that allows you to grasp enemies with a Gravity Gun-style glove and smash them into walls/floors/eachother. Momentum will take on a key role here, allowing powered up attacks to devestate the droids hunting you down. All the footage here from the pre-alpha is created in Unreal Engine 3, but come final release day, Eden Star will be a bona-fide Unreal 4 product. Which naturally means one spiffy looking game. The Brummie team behind Eden Star is looking for £620,000 to bring their game to full fruitition, and I think they genuinley deserve that. Since the Kickstarter gaming revolution kicked off last year I’ve seen plenty of games appear on the site, and whilst often many are interesting, not all feel innovative and original. Eden Star feels like something special. If you feel the same as me, you just need to hop on over to the Eden Star Kickstarter campaign page and back the project. Every backer tier comes with bonuses, and just a fiver will bag you access to the alpha, some soundtrack MP3s and your name in the credits. So take a look, I don’t think you’ll be dissapointed.